11.05.18 The first game of the World Chess Championship Match will take place on Friday, November 9, 2018 at The College on Southampton Row in London. 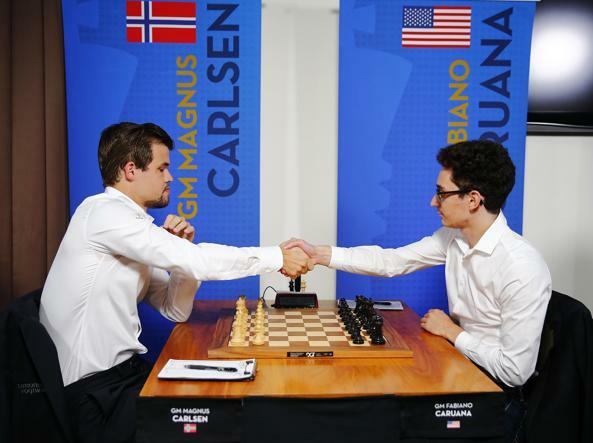 Current World Champion Magnus Carlsen will attempt to defend his title against Challenger Fabiano Caruana. Here's the Match Preview with schedules, rules, and links. This is the first time since 1972 that an American-born player will be challenging the title of World Chess Champion. The Match will feature the number one and number two players in the world. On recent strong performances, the Challenger Fabiano Caruana (2832) has inched within three rating points of the Champion Magnus Carlsen (2835). The Match will be contested in twelve games.The time control for each game will be: 100 minutes for the first 40 moves, 50 minutes for the next 20 moves and then 15 minutes for the rest of the game plus an additional 30 seconds per move starting from move 1. The winner of the Match will be the first player to achieve a score of 6.5 points. If, after twelve games, the score is tied after a new drawing of colors, four tie-break games will be played. The games will be played with 25 minutes for each player and an increment of 10 seconds after each move. If, after these four games, the score is still tied then, after a new drawing of colors, a match of two games shall be played with a time control of 5 minutes plus 3 seconds increment after each move. In case of a tied score, another 2-game match will be played to determine a winner. If still there is no winner after 5 such matches (total 10 games), one sudden-death game will be played. If the score is still tied after five matches as described in Article 3.7.2, the players shall play a one sudden death game. The player who wins the drawing of lots may choose the color. The player with the white pieces shall receive 5 minutes, the player with the black pieces shall receive 4 minutes whereupon, after the 60th move, both players shall receive an increment of 3 seconds starting from move 61. In case of a draw the player with the black pieces is declared the winner.